Home Stock & Shares Why Has Google’s Share Price Risen On Record £1.3 Billion EC Fine? Why Has Google’s Share Price Risen On Record £1.3 Billion EC Fine? Yesterday the EC slapped Google, or rather its parent company Alphabet, with a huge £1.3 billion fine. The punishment was doled out in response to what the EC’s competition commissioner Margrethe Vestager found to be a clear strategy to strangle any competition for online ‘search’ advertising. It might be expected that the share price of any company hit with a fine of that magnitude would crumble. Alphabet’s rose. Anyone investing online in Alphabet shares realised a return of 2% on Tuesday’s closing share price of $1202.46 and Wednesday’s $1226.43. Why? Despite the huge size of yesterday’s fine it could have been far worse. Google were found to have restricted publishers from displaying any search ads from rivals on their online properties, thus stifling competition and innovation. It did so by leveraging the dominant market position of its AdSense platform, forcing publishers who used it to not simultaneously offer exposure to rival ad servers. However, Ms Vestager had the power to impose a much higher maximum fine. The fact that she didn’t, despite a history of hammering Alphabet, obviously came as a relief to investors and represented a better outcome than had been feared. £1.3 billion is actually by far the lowest sum of the now three fines Ms Vestager has imposed on the online advertising giant. In 2016 the company was fined €2.4 billion (£2.08 billion) for giving its own services priority over rivals in its own search rankings. 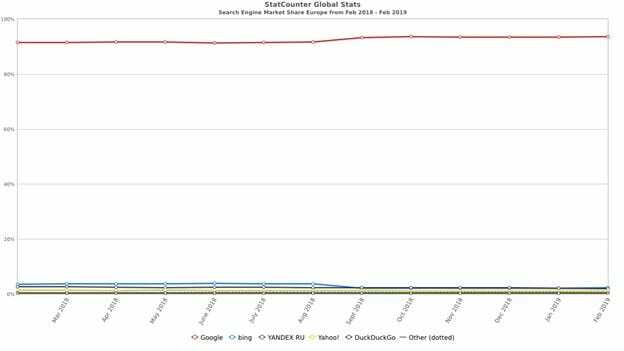 Google had a 93.65% share of the European search engine market as of February 2019. In 2017, Ms Vestager hit Google with its biggest fine to date – €4.3 billion (£3.72 billion) after it was judged to also be using its smartphone OS Android, which had a 71.2% share of the European market as of February 2019, to stifle competition. Alphabet, it was ruled, was forcing smartphone makers who used Android to prioritise Google applications ahead of those of rivals by obliging they were pre-installed in new phones and insisting competitors were not. There is increasing concern, particularly in Europe, at the increasing hegemony the biggest tech companies hold over markets. Google is forecast to swallow up a huge 31.3% of all digital advertising spend globally in 2019. A further 20.5% will be cornered by Facebook, meaning that over 50% of all of the money spent on online adverting across the globe will pour into the coffers of just two companies. Google’s influence extends further than just the search engine which has a near monopoly across much of the world. The Android operating system was installed in 88% of smartphones globally as of the end of last year. Add in Gmail, the world’s most popular email service, Google Maps, the dominant maps and navigation app across digital devices, YouTube, the hugely popular content streaming platform and Google Chrome, which has over 70% share of the internet browser market and the company bestrides the digital space that now makes up a huge part of the global economy. Regulators around the world are increasingly moving to try to clip Alphabet’s wings with the hope of stimulating increased competition and choice for consumers. Whether the march of the tech giants can be halted, as the dominant players move into more and more hugely valuable verticals, crushing the competition with their deep pockets and tech expertise, is another matter. Google this week announced a move to enter the gaming market with its new Stadia platform to offer streaming of video games in a similar way to how Netflix offers video content. It has the potential to upend a $135 billion global industry Google currently has minimal commercial interest in. The tech giants now have far bigger turnover than many countries. Alphabet’s 2018 revenues of $136.819 billion would make it the 56th largest country in the world by GDP, ahead of Ukraine. The dominance of companies such as Alphabet, Amazon and Facebook, and their continued growth into new markets and verticals has reached a point that it would appear that the only way that their reach might now be limited is by regulators ensuring some space for competition. Fines giving way to new, strict regulations designed to limit the reach of tech giants, or even attempts to break them up, is by far the greatest threat they face over coming years. Their position is now so powerful and ensconced, it is difficult to see how anything else might change the status quo in the foreseeable future.